After an unfortunate turn of events at last years, football IASAS 2017 in Bangkok, the boy’s football varsity team was unable to pick up a medal to break a 9-year deadlock and make history. A 3rd and 4th game was cancelled due to heavy rain and flooding. It was disappointing to see this chance go to waste, but there was a light at the end of the tunnel. There needed to be a fresh start for the boy’s football varsity team of 2018 and it came in the form of a new coach. Not just any coach could do the job and one man was called up to take the spot. 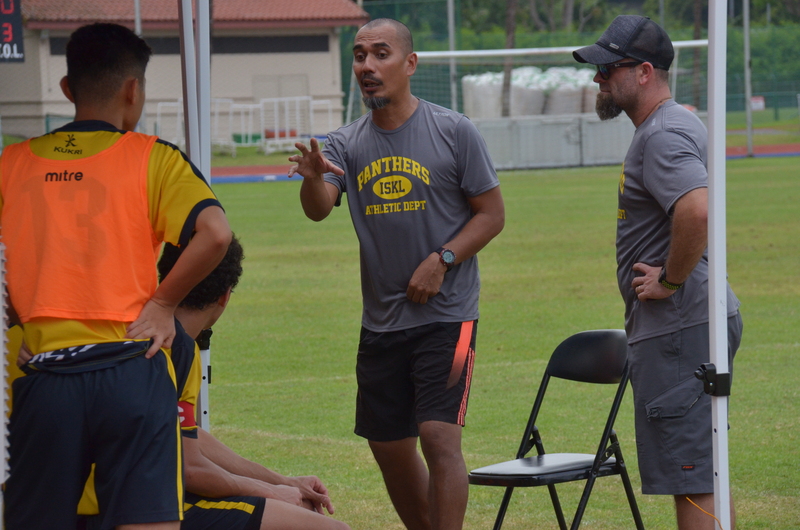 Yuzaiman Zahari hasn’t always been a coach for football teams, in fact, he has played professionally for club and country. Yuzaiman Zahari was an exceptional player at the height of Malaysian Football where he flourished as a footballer. Yuzaiman Zahari started out in the first division of Malaysian Football at a club called Kuala Lumpur FA in 2000. Yuzaiman Zahari placed 8th and 10th with Kuala Lumpur FA between 2000-2002. In 2002, however, he dropped down to the second tier division football in Malaysia to a team called Selangor MPPJ in which Yuzaiman Zahari had a great success. Yuzaiman Zahari played in Selangor MPPJ between 2002-2005 winning the second division title and bringing Selangor MPPJ to the first division football. In 2004, before going back into first division football, Yuzaiman Zahari was called up to play for the national team where he made 3 appearances. Finally, in 2005, Yuzaiman Zahari signed for a new club PKNS, where he played 3 seasons until 2008. Being one of the biggest legends to step foot on a football field here in Malaysia, ex-professional Yuzaiman Zahari or better known as “Coach Man “ at his job in KLYS academy. Last year he was called into coach the JV football team here at ISKL and with a remarkable season, they managed to place 1st in the ISAC championship. Coach Man has had a history of coaching the JV football and this year he was called up to coach the Varsity Boys Football in search to find the gold at IASAS. It’s a big difference when you have a professional football player as a coach because it brings out that experience of top-flight football. Coach Man brought more than experience to this team about football, he brought lessons of life that are relevant to football. Coach Man didn’t teach the team lessons for just the pitch, he taught life lessons about dedication for the players to carry with them always no matter what. As we only trained 3 times a week and maybe a game on the weekend, Coach Man was always encouraging us to do at home training to keep up the fitness so that when practices do come around, we will be ready to perform. Most of the training was rained out but that didn’t stop the team from having indoor training in the gym to maintain team fitness. He taught us discipline, in how we chose to continue to train even if the odds are against our favour because we wanted to perform at our peak this season. Coach Man would send us motivational messages on out Varsity Soccer WhatsApp chat to get us in the right mindset to train or play games, to feel focused and ready to perform. Coach Man inspired the team to work hard and we will be able to reach our goal whether on the field or off the field but the workload has to be there and done well. In football as well as in studies we put in the work and the results will come. Going into IASAS after a season coached by Coach Man, the team clinched a 1-0 victory against ISB in the consolation game for 3rd. It had been 9 years since the team was able to wear a football IASAS medal. With the help of Coach Man and an inspired team, it was a dream that came true.